The American Academy of Osteopathy presented a Prolotherapy weekend at the University of New England College of Osteopathic Medicine (UNECOM) in Biddeford, Maine from October 7th-9th 2010. The location in southern Maine, right on the Atlantic coast in early autumn, could not have been more beautiful. The course was presented by Mark Cantieri, DO and George Pasquarello, DO who, with Tom Ravin, MD, have recently released a textbook on Prolotherapy entitled Principles of Prolotherapy. ThePrinciples text was initially developed in part because the authors wanted to have a modern, practical textbook on the subject to use in these courses. The weekend course format consisted of lecture time and live examination and diagnostic portions, as well as laboratory cadaver anatomy review, and fresh tissue injection instruction and practice. The course was attended by MDs, DOs, and NDs from the United States and Canada with varying experience in Prolotherapy, from those who had recently started to use Prolotherapy on a few patients, to others who had been practicing Prolotherapy for many years. The course was well designed to offer something for everyone—well worth the time for the seasoned Prolotherapy doctors, as well as a great introduction for the beginner. 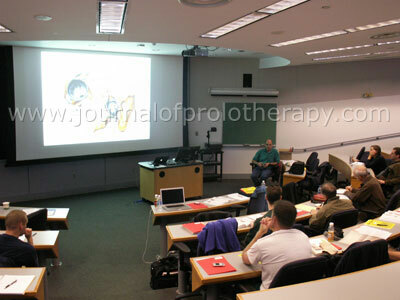 Lecture portions included an introduction to Prolotherapy and the history of Prolotherapy, as well as specific lectures for treatment of each anatomical area. Background information on traumatic injuries and degenerative postural models were presented to describe etiologies of the major ligament and tendon damage treated with Prolotherapy (basically, how the injuries occur). Wound healing physiology was reviewed to show the process that Prolotherapy is designed to stimulate, as well as review the factors that can improve the healing process and those that can hinder it. Dr. Cantieri spent time discussing the use of a structured rehab program, or physical therapy program, in combination with the Prolotherapy to give optimum results to the patients. There was also time spent reviewing the types of pain medications that can be used in conjunction with Prolotherapy treatments, the pros and cons of narcotic use, and the duration of time patients need to be off anti-inflammatory medications before and after treatments. Dr. Pasquarello also lectured on coding and billing procedures for Prolotherapy. Mark S. Cantieri, DO, FAAO lecturing the course attendees. After the initial introduction lectures, the course format followed a revolving cycle starting with a lecture which described the area of focus to be treated with an anatomy review and areas of danger or other salient features. The course attendees then would move into a room with examination tables for instruction and practice of pertinent physical examination skills on each other. Following this live examination time, the attendees would move into the anatomy lab for a hands-on anatomy review and to practice injections. It was a great honor to be able to study human anatomy using real cadavers, and we were reminded of the debt we owe to those who have donated their bodies for science so that we could learn how to better help those who are living. Due to government regulations, no photography is allowed in the lab and only licensed medical professionals, or those who are training to become medical professionals, are allowed in the anatomy lab. Prior to this course, a group of anatomy and osteopathic manipulative medicine training fellows from UNECOM had dissected an embalmed cadaver to create a very good example of the prosected anatomy that we would be injecting. These same teaching fellows reviewed the anatomy with the course attendees, and we were able to view and palpate the various muscles, tendons, ligaments and bones and closely examine their relationships to each other and the rest of the body. There were also many helpful models and other prosections to give a clear mental picture of the structures that we were going to inject. Following the laboratory anatomy review, we moved into the fresh tissue side of the lab for injection instruction. Having a fresh tissue lab is not a common thing, even for a medical school, because most teaching and studying of anatomy is performed on embalmed cadavers that can be stored for long periods of time without degradation of the tissue. Fresh tissue cadavers, on the other hand can, only be used for a short time before normal decomposition advances. The un-embalmed cadavers must be stored in a dedicated cold storage facility and there are numerous regulations that make it difficult to maintain a fresh tissue lab. The problem with using embalmed tissue for injections, however, is that the needle feels like it is going through layers of rubber instead of the texture that a live human’s tissue presents. Therefore, injecting un-embalmed tissue is the best way to approximate the feeling of injecting the real thing while removing the inherent dangers of practicing injections on a live person. UNECOM’s fresh tissue lab is the main reason this course is held in Maine. In the fresh tissue section of the lab we were required to wear complete protective gear including body smocks, booties, gloves and face masks with eye shields. We were reminded that because the cadaver had not been embalmed there was still the chance that contact with body tissues or fluids could communicate disease and universal precautions were followed, including carefully monitoring the used sharps. For each section, Dr. Cantieri or Dr. Pasquarello would demonstrate the proper injection technique and then each attendee would have time to practice injections, feeling the needle move through the tissue layers down to the bone and trying different angles and approaches to reach the location of interest. It was very helpful to get the feel of the needle in real human tissue and be able to experiment a little with different approaches without the fear of causing complications to your patient. As an example, when injecting the thoracic region we were able to inject the ribs and march the needle off a rib until we could feel the needle drop into the thoracic cavity, thereby seeing how far you could move. In a live patient this same experiment would most likely cause a pneumothorax and the patient would wish you had experimented on someone else. George Pasquarello, DO, FAAO demonstrating Prolotherapy injections. The course participants were divided between beginner and advanced groups, and Dr. Pasquarello and Dr. Cantieri taught these groups independently. The groups were divided based partially on practice experience but also on previous course experience. The beginner course focused more on extremities and areas of injections with the least amount of potential danger zones, while the advanced course spent more time on the mid line, spinal and rib injections. By taking both sections, a practitioner can get training in most of the body areas that are usually treated in a normal clinical practice. While one group was getting a lecture or spending time reviewing physical exam techniques, the second group would be in the anatomy lab reviewing anatomy on cadaver prosections or practicing injections on a fresh tissue cadaver. At the end of the course Dr. Pasquarello and Dr. Cantieri were kind enough to treat any of the course attendees who wanted to be treated, and the rest of the attendees could watch and interact with questions and observations. This was a very informal time and gave great benefit to both the people who were treated, as well as the others who observed the procedures. Overall, the course was a great way for the seasoned Prolotherapy physician to enhance their skills or for a physician who wants to start using Prolotherapy to learn the basics. For more information on upcoming Prolotherapy courses through the American Academy of Osteopathy, go to http://academyofosteopathy.org/ or call the AAO at (317) 879-1881.